I am pleased to report that, unlike last year, the 2014 Masters passed without any controversial Rules incidents. One Rules infraction that was not widely reported, probably because it had no significant impact on the leaderboard, was incurred by Luke Donald, resulting in his first round score of 79, instead of the 77 that he thought he had scored. The facts of the penalty were that in making a stroke from a bunker, Donald hit his ball fat and it failed to clear the bunker lip rolling back into the sand. 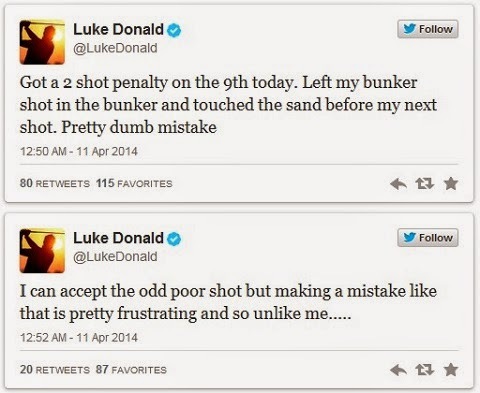 His instinctive reaction was to smack his club into the sand in disgust. I expect there are many of us that can relate to this instinctive act of frustration. However, in doing so, he breached Rule 13-4b, which states that a player may not touch the ground in a hazard with his hand or a club. Of course, there is nothing to stop a player venting their frustration in this way if they have succeeded in extricating their ball from the bunker first. "Duncan was told he had to wear tennis shoes like all caddies. We are not treating him any different. I am sure whatever reasons he raised were considered." I am delighted that the Masters has brought a flood of new subscribers to my two free, weekly email lists. If you are already a ‘Rhodes Rules School’ subscriber don’t forget that you can move from the original photo series of 99 issues to the ‘How Many Strokes?’ series of 99 issues by purchasing the complete set at this link. Similarly, you can advance from the ‘How Many Strokes?’ series to the current ‘9 Questions About’ series, by purchasing that complete set at this link. When you write controversial Rules incidents in your opening paragraph i assume you are referring to a certain Tiger Woods breaking a rule of golf and not being disqualified? Yes, if you click on the link, 'last year' in the first line of the blog above, you will find my detailed explanation of the circumstances around Tiger's 'wrong drop' at the 2013 Masters.